This is where we live! Shibuya is where many restaurants/izakaya, clubs, bars and shopping building gather. The city attracts young adults from 20 something to 30 something. I must say you might feel like you are not in Japan because Shibuya is filled with tourists. Shibuya is smilier than Shinjuku but you find more younger crowd. During the day-time, you see teens in uniform walking around, and at night to the next morning, young adults in 20's are partying in the night clubs. If you're looking for a crazy night life, or coming with a family with teenagers, you'll probably like Shibuya. Also, Shibuya is one of the main transportation hub in Tokyo that makes getting to airports and any other tourist site so much easier. One of the main reasons I live in Shibuya is the convenience in transportation. Most of exits are gathered closely except JR New South Exit. N'EX platfoam is on the New South Exit side, so remember to add 15minutes to your travel time. If you get lost or loose your friend, easiest way is to meet at Hachiko or TSUTAYA. Everyone knows where it is so even thought you don't speak Japanese, people will take you there. Below is how I remember which exit to get out according to where I want to go. Most people take pictures from Starbucks coffee in TSUTAYA in Qfront but not many knows my SECRET SPOTS to take over head pictures and videos. Note: You can also see from L'Occitane Cafe and Gusto but you need to be lucky enough to be seated by the window which is a very low chance. You can try though. Center Gai is one of the most busy street in Shibuya. You can cross the Scramble Crossing and go into the street on the left of Tsutaya. These restaurant below are promising. We go there literally all the time. There are so many to check out. 109 for GAL(garu) fashion, Don Quijote for cosmetics and all kinds of weird stuff, Tokyu Hands and Loft for various goods, Big Camera and LAVI for electronic items. Paolo enjoy running every morning in Yoyogi Park, so you might see him if you go there in the morning! There are always some kind of events going on on the weekends. They won't rip you off like in Golden Gai. Food is actually good so try little dishes on the side of your drink. There are the hottest clubs in Shibuya. HIP HOP clubs tend to have younger crowds and EDM clubs have 'older' crowds. Don't expect Japanese arcade to be the same as the ones in your country. It's completely different world! In Japanese, arcade is called 'Game Center' so don't say arcade if you're going to ask locals for a direction. Check out the list of my favorite bars where you can meet up locals and other travelers. Sorry the map is upside down to fit everything in. These are 3 of my recommendations. I never actually paid to stay there but I have sneaked in when my friends from overseas visited me. 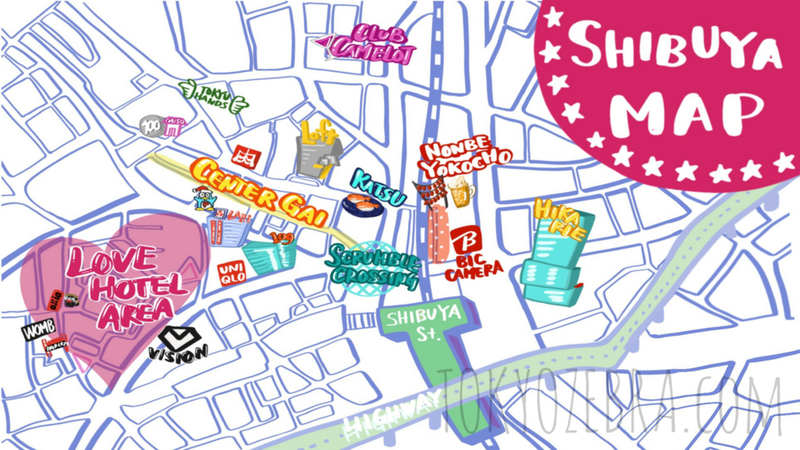 The hotel is located just between Harajuku are and Shibuya, so if you are into shopping, this hotel is perfect. One of the highlight of this hotel is onsen where you can relax after long shopping day! Their room is quite spacious and well-cleaned. You will be comfortable at this hotel. Granbell Hotel is in 3minute-walk from West Exit of Shibuya Station which is easy to get on JR Yamanote line, Toyoko line, and Fukutoshin line. If you are planning to not staying in Shibuya but explore various parts of Tokyo, this hotel would be a convenient hub. Most of the room is well-designed, but some has interesting theme like Bear Room. Excel Hotel is directly connected Shibuya Station so I can almost say this is the hotel that has THE BEST ACCESS to station! Great clean room with a good service. The hotel is one of the pick-up/drop-off location of Airport Limousine bus to Narita and Haneda. It is pricy but if you don't mind paying for the convenience, this is a great option. It is also directly connected to Mark-City which has many restaurants and shops.